What Happens When You Combine the LA Phil, Shakespeare and Tchaikovsky? Updated: The Los Angeles Philharmonic has an exciting concert coming up at Walt Disney Concert Hall featuring a unique program specifically for you music-loving Shakespeare enthusiasts. 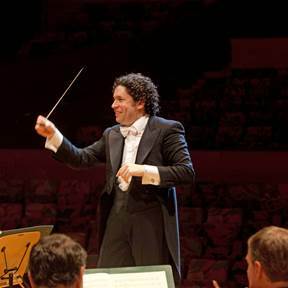 It’s Shakespeare Fantasy, a special concert presentation that is part of the LA Phil’s TCHAIKOVSKYFEST on Wed. Feb 26th, with conductor Gustavo Dudamel and the Simón Bolívar Symphony Orchestra of Venezuela. The program will include music inspired by Tchaikovsky’s love for Shakespeare, including his Hamlet Fantasy Overture, The Tempest Fantasy Overture, and Romeo and Juliet Fantasy Overture. Here’s the best part. The performance will also feature Orlando Bloom, Joe Morton and Condola Rashad presenting key scenes from Shakespeare’s plays before each piece. Bloom and Rashad recently played the title characters in Romeo and Juliet on Broadway, and reprise their roles here for one night only. The all-star cast is directed by Kate Burton, Tony-nominated stage and screen actress and daughter of the late Richard Burton. This really is a one-of-a-kind event as Dudamel and the LA Phil celebrate the English playwright whom Tchaikovsky adored; so much so that the composer once thought of learning English just to read the plays in their original language. You can also join renowned music scholar Joseph Horowitz at 7:00 pm for a FREE Upbeat Live pre-concert talk that will provide historical and cultural context for the concert.